The whistle signalling the end of the morning shift had just sounded when six deminers emerged from the tall grass, took off their protective clothing and walked back to the rest camp for lunch. "I never thought I would end up as a deminer," Jamba Besta, the team leader, said. "All I wanted was to become a secretary, I even took the qualification, but when [this] offer came up, I took it." Like Besta, all the deminers are women. They work in Bongo, a small community on the road from Juba to Yei in Southern Sudan, for the international NGO Norwegian People’s Aid (NPA) Mine Action. Besta's all-female demining team is a first for Sudan, although successful examples are found in Kosovo and Cambodia. Despite some abuse, especially from drunken soldiers passing by, the team's reputation has inspired commercial contractors to follow suit. "They [the drunken soldiers] insult us," Besta said. "They laugh at us and say that women cannot remove landmines. But ladies can do just as well as men if they are trained." The role of the women in demining has been championed by the UN Mine Action Office (UNMAO). 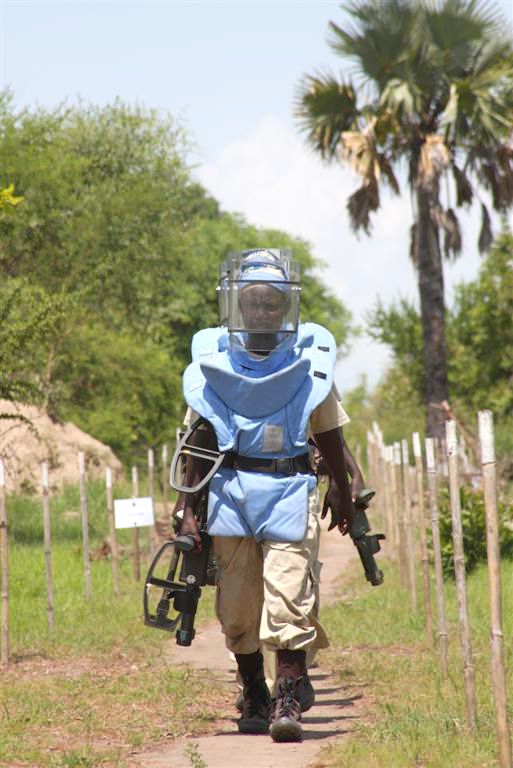 "Female deminers work really well," Johann Maree, UNMAO operations officer in Yei, said. "They are constant and reliable." Women deminers have proved more effective than men, according to NPA officials: "Women are very accurate and organized," said Kjell Ivar Breili, NPA programme manager. "They don’t get drunk as the men often do... Over the past two years, they are the teams that have found the most mines." Demining is a necessary activity in Sudan where more than 20 years of conflict left 19 out of the 25 states affected by mines or explosive remnants of war (ERW). ERW include unexploded ordnance - such as bombs, mortars, grenades, missiles, cluster munitions or other devices that fail to detonate on impact but remain volatile and can kill if touched or moved - and "abandoned ordnance" or weapons left behind by armed forces when they leave an area. Men risk death or injury when working in the fields, and women are in danger when collecting firewood or carrying water. According to UNMAO, the true extent of Sudan’s mine and ERW problem is unknown, but since 2002, UNMAO and its partners have had some success: They have opened up more than 29,000km of roads, cleared 45 million square metres of land, and destroyed over 16,000 anti-personnel and anti-tank mines as well as 800,000 ERW. Despite this, mines and ERW continue to maim and kill people in various parts of Sudan and obstruct the delivery of humanitarian aid. They also hinder the return of refugees and displaced people and slow down reconstruction, development and peace building. The job with NPA brings in US$250-$400 per month, and it is a stable, regular income. The women also get three months’ maternity leave, after which they are relocated for nine months at the administration camp in Yei, where they work on other tasks and receive training while being able to breastfeed at regular intervals, until they are ready to go back to the minefield. "As long as you’ve got proper training and you take precautions, demining is not more dangerous than any other job," Breilli said. "I think it is far more dangerous for women to go out in a contaminated field and collect firewood." According to the NPA, some of the women in its programme are inspired to work hard because they have families or relatives in the villages where clearance is being done. 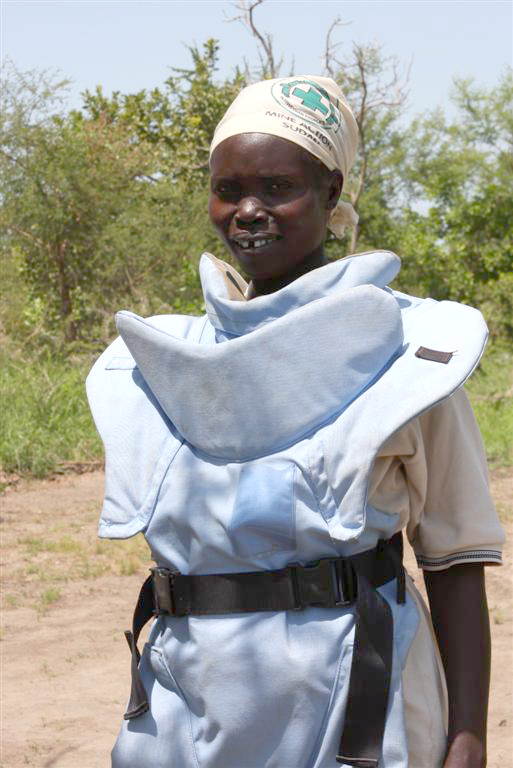 "I want to help rid [this] area of landmines," Besta, who is six months pregnant, said. "I like the fact that I can help [my people] feel safer."